Are you interested in learning something new? You can learn something new right now from InformIT. And if you use the coupon code SPRINGVID you can save 70% now through May 30, 2017. You can learn Responsive Web Design or HTML and CSS from me, and for a much cheaper price. There is also the Front End Web Development Complete Video Course that I helped out with. This is a spectacular deal on all the InformIT videos, not just mine. If you were thinking about learning some new technology, then now is the time to check out the InformIT videos. Free Video Tutorial: Do you want to add video backgrounds to your pages? When I first started creating video backgrounds I was surprised to learn that making the video for the backgrounds was the hardest part. So as part of my new video series “Learn Responsive Web Design LiveLessons” I included a lesson on building video backgrounds. And it’s available for you to watch for free. Do you want to learn RWD? Do you like video learning? If you answered yes to both these questions, then you’ll be thrilled to learn that my latest video series “Learning Responsive Web Design LiveLessons” will be out soon. 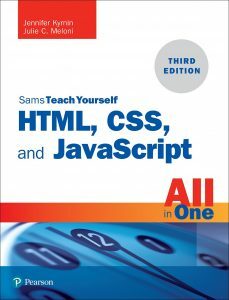 This is a 12-lesson video series based on my book Sams Teach Yourself Responsive Web Design in 24 Hours. I am currently working on the final edits and I hope to see it on the virtual shelves of Informit.com within the next few weeks. This has been a fun project for me to work on as it combines my love of web design with my driving desire to help people make web pages as responsive and accessible as possible.